Once upon a time, as local legend goes, two giant brothers, Vincent and Goram, lived on this land. Vincent, wanting to to raise some sort of lasting tribute to himself, decided to create a huge earthwork in the area. Not to be outdone by his brother, Goram too started work on his own memorial. 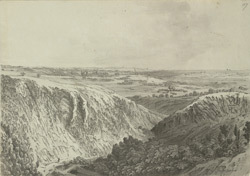 He first dug out the gorge, seen here in this view, as a place to rest during such a strenuous task. The giants had only one pickaxe to share between them to carry out their work. Since they were both of a lazy disposition, they arranged that when one had finished with it, he would then hurl it across the three miles to the other with a warning shout that it was on its way. This set-up worked well until one day, when Goram was having a sly 'forty winks', Vincent, having temporarily finished with the axe, hurled it to his brother with the prerequisite warning. In a split second he realised the awful impending fate about to befall his brother. The axe flew across the gorge and lodged itself in Goram's head - and so Goram's Chair became the final resting place of the lazy giant!